In additional to the main analysis, researchers also examined two alternative streams of information: social media and niche publications directed at the Mormon community. Each revealed a tenor quite different from the mainstream media as well as from each other. An additional analysis of the conversation about religion and the two major candidates between August 2011 and November 2012 reveals just how far social media departed from the more reserved treatment of both Obama and Romney by the legacy media. And an additional analysis of a group of digital niche publications directed at the Mormon community highlights the ambivalence that community felt about being in the spotlight during the campaign. In social media, the conversation about religion and the two major candidates was far from the reserved approach of the mainstream media. On both Twitter and Facebook, the majority of the discussion about Romney’s Mormonism was highly negative, while suspicions of Obama’s relationship to Islam came through more strongly than statements refuting them . Twitter discussion about Romney’s Mormon faith during the primaries and general election put the social media platform’s characteristics on full display. The micro-blogging format lends itself to spontaneity and rawness, and as such, the tone of the conversation was often irreverent. 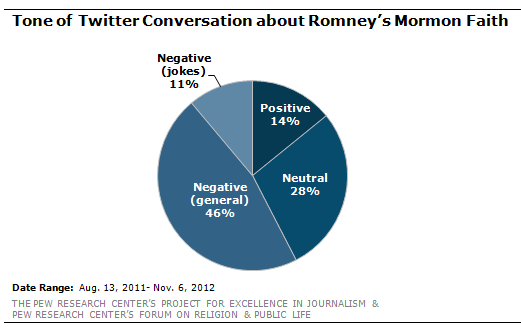 More than half of the assertions about Romney’s faith (57%) were negative in nature, while only 14% were positive. Others were more conspiratorial, reflecting their sense that Romney and his faith are secretive: "Wonder if Romney’s taxes highlight his leadership positions in the Mormon church and he doesn’t want people to ask about it," tweeted TheRitaPhD on Aug. 11, 2012. A significant portion of the negative conversation on Twitter came in the form of jokes – 11% of the entire conversation and 19% of the negative assertions. The high volume of jokes is a finding that has surfaced as a pattern in other research on social media (see a May 2011 PEJ study about social media reaction to Osama bin Laden’s death and an August 2011 study about the reaction to the death of Steve Jobs). Even the positive assertions were often a reminder of the hurdle Romney faces with certain voters. "I just don’t understand why people wouldn’t vote for Romney just because he’s Mormon. #ignorant," tweeted Tbarnes34 on Aug. 30, 2012. Another 28% of the assertions were neutral, which often came in the form of a user simply mentioning that Romney is affiliated with the Mormon faith. s on Twitter, the relatively few positive assertions about Romney’s faith on Facebook often were responding to criticisms. One user wrote on Aug. 29, 2012, "I should not dignify this nonsense with a post, but I just can’t let it go. This guy is making a LEAP by calling Romney a racist because he’s Mormon. Huh?" And the negative discussion was often harsh and suspicious. "Before anyone supports Mormon Mitt Romney for President, they need to know the extremely unique Mormon ‘End of the Age‘ viewpoint and especially the ‘White Horse Prophecy‘! Once properly understood, you will realize that no genuine Christian could ever support Mitt Romney for President," wrote another Facebook user on June 11, 2012. Though Obama identifies as a Christian, the supposition that he is secretly a Muslim has existed since before his election in 2008. The controversy reached a crescendo in 2008 but has never fully disappeared. On social media during the 2012 campaign, this allegation or rumor was espoused about twice as often as it was refuted. 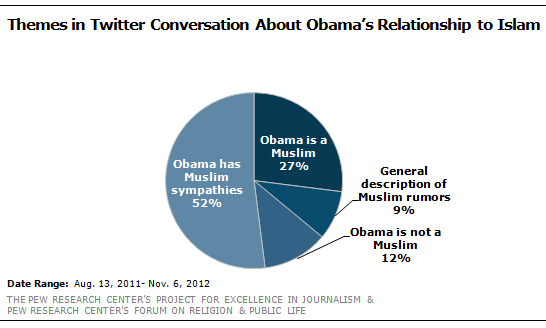 On Twitter, the biggest portion of the conversation about Obama’s relationship to Islam was not contending that he is a practicing Muslim but rather that he has sympathy for the Muslim world (52% of the conversation). Yet 27% of the conversation espoused the belief that he is a Muslim, while 12% refuted that idea. The remaining 9% of the Twitter conversation consisted of general descriptions of the Muslim rumors, neither espousing nor refuting them. Those who espoused the rumor often used "Muslim" as an epithet: "He just needs to be removed for being a fraud and basicly obama is nothing less then a Muslim Radical Terrorist," wrote one user on Dec. 18, 2011. Those who accused Obama of having sympathies with the Muslim world often referred to his administration’s actions in Egypt and Libya: "Obama praises the Muslim Brotherhood takeover of #Egypt. Is anyone surprised? I’m not," said one Twitter user on June 25, 2012. 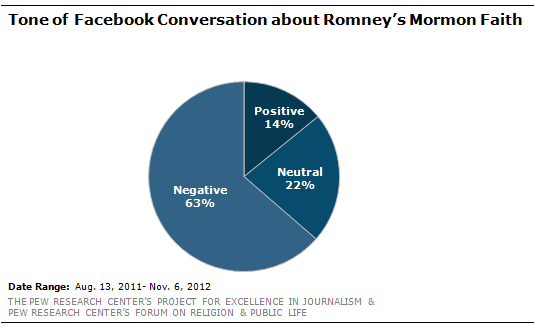 As with the social media discussion of Romney’s faith, the Twitter and Facebook conversations about Obama and religion were largely aligned. 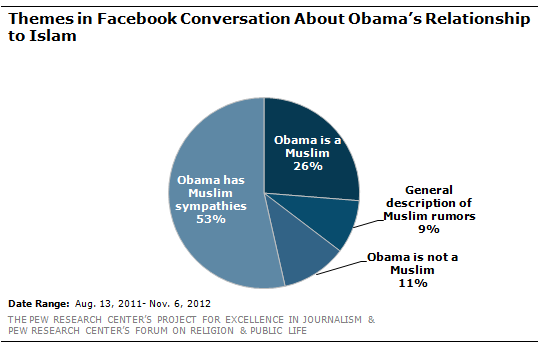 On Facebook, 53% of the conversation consisted of arguments that the president unduly sympathizes with the Muslim world. Another 26% consisted of rumors that he is Muslim, more than twice the portion (11%) refuting that rumor. And 9% consisted of neutral descriptions of those rumors. [i] Spelling errors and typos in social media postings are left uncorrected to preserve authenticity.